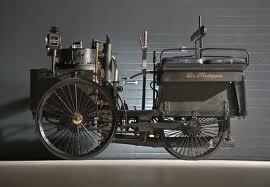 The world’s oldest running car, which is the steam-powered 1884 De Dion Bouton et Trepardoux Dos-a-Dos Steam Runabout, was just sold for double what RM Auctions originally expected it to fetch. The historic auction in Hershey, Pennsylvania, saw bidding go all the way up to the princely sum of $4,200,000, and after the ten percent commission from the house, the total bill came to $4.62 million. “We were honored to have been entrusted with the sale of this most important motor car from the renowned collection of the late Mr. John O’Quinn. The world’s leading automotive collectors recognized the incredibly rare opportunity the sale represented, as was reflected in the spirited bidding and impressive result,” said Rob Myers, Chairman & Founder, RM Auctions following the sale. Commissioned by French entrepreneur, Count de Dion and named ‘La Marquise’ after his mother, the car has stayed in the same family for the duration of its 127 life. This little gem is the protagonist of the first car race in history, where 16 mph/ 26 km/h, and it has some more recent prizes, as it won to awards at the 1997 Pebble Beach Concours. The Runabout had been in the same family for 81 years prior to the sale, and is one of six De Dion tricycles known to still exist. A total of 20 of the three-wheelers were built. When new, the trike had a top speed of 38 mph and a range of 20 miles on one tank of water. The vehicle that sold last night was the only car to show up for the world’s first auto race, where it averaged 16 mph over a 20-mile course.